Fun fact: Two tablespoons of seed can produce 10 acres of cigar tobacco! First comes the harvesting of the leaves, in itself a thoughtful and careful process. Leaves that are harvested from the bottom of plants (Valdo) have the mildest flavor. Middle level leaves (Seco) which are the largest leaves and some say best tasting, deliver milder flavor, while the top leaves (Corona) have the greatest exposure to the sun, and therefore the most pronounced taste. Fun Fact: Valdo, Seco, and Corona only apply to Sun Grown tobacco. In Cuba, wrapper tobacco that is grown in the shade (under cloth) is called Ligero (light), Seco (dry), Amarillo (yellow), and Viso (Glossy). These pre-sorted leaves are re-sorted according to size and texture. They’re bundled and hung to dry (cure) for 6-8 weeks. During curing, the tobacco leaves must be able to release moisture and (sweat or ferment) rid themselves of toxins like ammonia and other chemicals that develop during the process. If proper fermentation has not occurred during curing, the resulting tobacco will not burn steadily and will have a harsh, bitter taste. In preparing premium cigars, the blender will carefully sort and strip the three components of a smoke – the filler, the binder and the wrapper. All this must be completed prior to the creation of the unique combination (recipe) of tobacco and wrapper that will result in a perfect smoke. The blender assembles a special combination of tobacco leaves to make the filler. 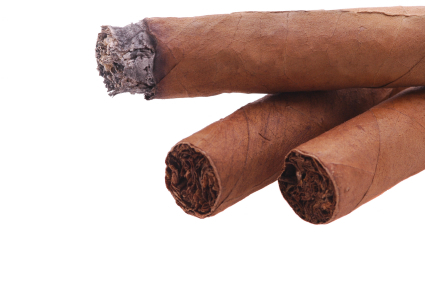 Depending on the type of cigar, its size and ring gauge, there may be as few as two and as many of four tobacco leaves in the mix. Blending is an art unto itself. The next art is shaping, and the ‘hand’ of the expert is revealed in a consistent shape and texture. A buncher forms the filler leaves into a neat cylindrical shape. A binder leaf comes next. Then, the entire cigar is placed into a mold to gently and slowly ‘massage’ it into a perfect cigar shape. When the shape has been achieved, a roller applies the outer wrapper leaf of tobacco and voila – cigar perfection…almost. After the cigar maker has ‘introduced’ the elements of the cigar to one another, the stogies are placed in the “marrying room” for a 3-week (minimum) honeymoon together. The ‘marrying room’ is actually a tobacco aging room, usually made of cedar, in which temperature and humidity are carefully controlled. During this time, Nature brings the various tobacco components together to synthesize their best qualities into the richly layered taste of a fine cigar. Lots of things go into how cigars smoke with this being an important step! It is not uncommon for some growers to skip this process – a serious mistake to true cigar connoisseurs.